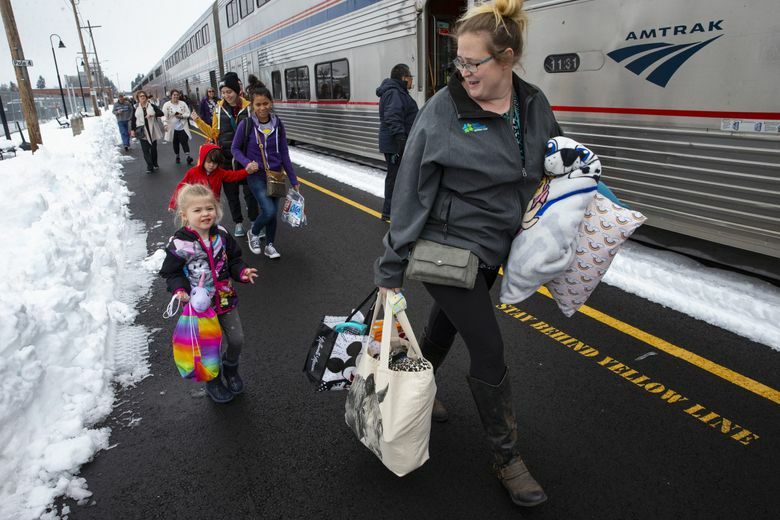 Late Tuesday, the ordeal was finally over for the last of 183 Amtrak passengers who spent 36 hours stranded in the snow in Oregon, as their train pulled back into Seattle's King Street station. They were longing for hot showers, their own beds and diapers, not napkins, for their babies. Late Tuesday, the ordeal was finally over for the last of 183 Amtrak passengers who spent 36 hours stranded in the snow in Oregon, as their train pulled back into Seattle’s King Street station shortly before 10 p.m. 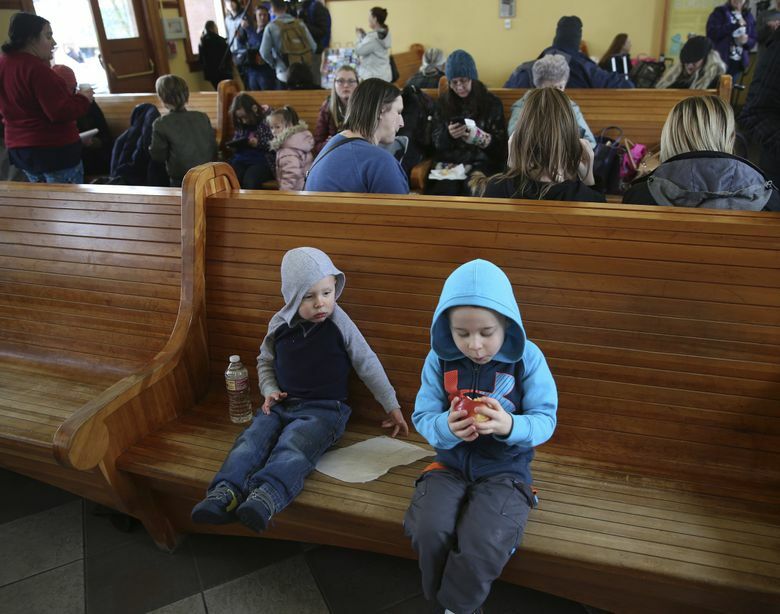 In addition to being stuck on the train southeast of Eugene for a day and a half, passengers who remained on the train through its return to Seattle experienced another hourslong delay in Portland. The train was forced to remain in Portland while crews in fireboats battled a blaze that erupted on a railroad trestle over the Columbia River, said Amtrak spokesperson Marc Magliari. It departed Portland around 5:30 p.m. Tuesday. By the time passengers aboard the Amtrak Coast Starlight were rescued Tuesday, more than a day and a half had passed since their departure from Seattle for Los Angeles. The train was passing through a remote, snowed-in area 40 miles southeast of Eugene when it struck a tree on Sunday evening, leaving riders stranded. “People were being very kind to each other, being friends. It restores your faith,” said passenger Tracy Rhodes. Tuesday morning, it began its stop-and-go journey north to return passengers to where they started their journeys. The train arrived in Eugene around noon Tuesday, where riders were greeted by Red Cross workers as well as food, coffee, water and doughnuts, said Amtrak spokeswoman Olivia Irvin. Some passengers waved their arms in jubilation, even though Eugene itself was snowed in, and riders weren’t able to connect with buses or other public transportation, Irvin said. The train was serviced before continuing on its slow northern trek. Amtrak has not said when the Coast Starlight will resume its planned trip to California. Trains between Portland and Eugene are suspended until Friday due to weather-related track closures. The double-decker train left Seattle early Sunday and struck the tree that evening. 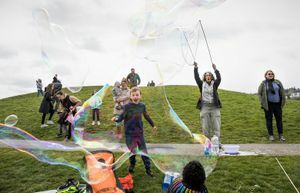 The train had been traveling on a portion of the Seattle-to-L. A. route that veers east, away from the Interstate 5 corridor and into the Cascade Mountains. 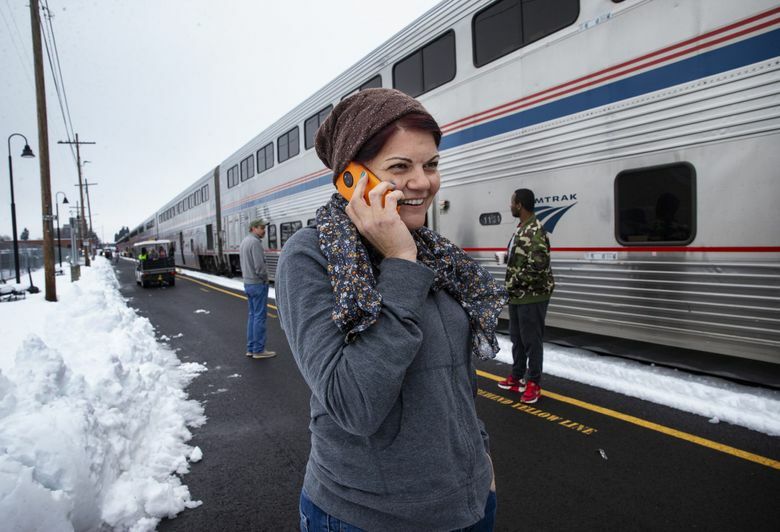 “It was surreal,” said Klamath Community College teacher Rebekah Dodson, who boarded the train in Albany, north of Eugene, and had expected to be in Klamath Falls by Sunday night. Passengers, along with the crew of 13, banded together through the ordeal. With cellphone service limited, younger passengers helped older ones reach their families to let them know they were all right, said Rhodes, of Scottsdale, Arizona. Rhodes added that a “mom brigade” was formed to care for and entertain the children. Passenger Carly Bigby, a teacher from Klamath Falls who had been visiting Eugene, told Portland’s KOIN-TV on Tuesday that parents had run out of diapers, and a worker in the cafe improvised with napkins and safety pins. Dodson said a friend was planning to pick her up in Eugene, but it would be a few days because the roads between there and her Southern Oregon home remain closed. “I’m worried about my job, but once we get to Eugene, it will be OK,” she said. At about 6:20 p.m. Sunday, the train “came to a sudden halt and the conductor said that they had some damage from some low-hanging limbs because of the sudden snowstorm and they were going to stop and fix it,” Dodson said. Rhodes said she was told the engine hit several snow-laden trees and that one snapped back, damaging a hose assembly providing air pressure for the brakes. The train was repaired enough to reach Oakridge, a nearby town 1,200 feet high in the Cascade Range whose 3,200 inhabitants were dealing with their own problems — a blackout and snow- and debris-covered roads. Officials decided it was better to keep passengers on the train than to let them scatter in the unlit rural area. “We made every decision in the best interest of the safety of our customers during the unfortunate sequence of events,” said Amtrak Executive Vice President Scot Naparstek. By Monday, more than a foot of snow had fallen in the area. The hours ticked by. Some passengers grew impatient. “This is hell and it’s getting worse,” Dodson posted on Facebook after 30 hours. Amtrak said there was enough food on the train for the passengers, and that passengers were not being charged for food and water, contrary to some social-media chatter. Rhodes tweeted: “The food hoarding has begun. I’m considering saving half my dinner steak and making jerky on the room heater.” But, she said, “We were fed very well. Steak at night, hot breakfast in the morning.” Coach passengers were given beef stew with mashed potatoes, she noted. Rhodes had been traveling with her brother to visit their 82-year-old mother in Klamath Falls, but with the highway impassable, she now plans to fly home to Arizona. Seattle Times reporters Hal Bernton and Asia Fields contributed to this story.